Hi Gang! It’s Cindy here and today I’d like to show you how you can create these fun and colorful ATC’s using you’re favorite Lindy’s color combos and products. This type of background is so much fun to create and you can also use this technique in other projects like cards, scrapbooking and art journals. 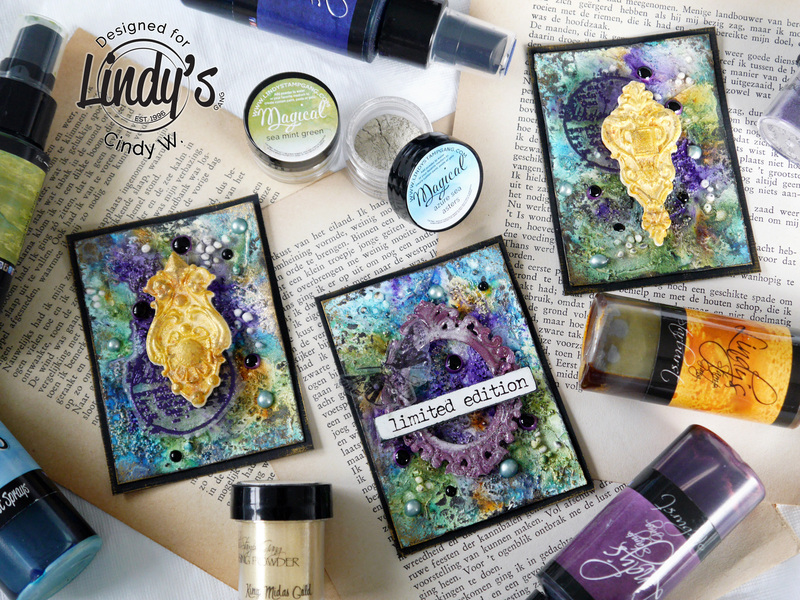 All you need are some different colors of Lindy’s Magicals, Shakers or Sprays and something to add texture like art stones or pastes. You can see I’ve collected a whole bunch of supplies and to be honest I ended up using not even half of it…lol. But you can see the color combination that I wanted to go with. Inspired by the colors of a Peacock’s feathers. My first step was to create texture. I’ve used white gesso mixed with paper paste and art stones. When you add these kinds of stones or powder to gesso it gives such a gorgeous grungy effect and it’s simply stunning when you add color to it. Especially when you use different sizes of stones and sand. Make sure you let it dry completely before you start adding color. The first layer of color that I added was Afternoon Delight Denim. You can achieve a pretty look using sprays, but while working on these backgrounds I realized powders work even better. So I collected my matching powders and added layers of color drying them in between. I tried to prevent them from blending too much, by sprinkling the powders next to each other rather than in the same area. I used a spray bottle to add water on the colors drying between layers. I’ve added three layers of blue, I just love Azure Sea Asters. After finishing the background, I used some black Memento ink to darken the edges and added some textured stamping. I love how black can bring out bright colors! I then took the clay pieces and colored them with sprays and powders, let it dry for a bit and used Versamark ink and Lindy’s Embossing Powder to turn them into gorgeous custom embellishments. To add an extra touch, I stamped a grungy circle on Heat Resistant Acetate (I also used a moth stamp), covered it with Lindy’s Embossing Powder and heat set all the images. The paper tends to curl up a bit, although I did use Mixed Media paper, so I’m using sticky tape to adhere the cards to their black background. I then added some drops in different colors to add the finishing touch. I love all this color Cindy! Wonderful ATC’s!